This week is already stressing me out and my class week hasnt even started yet. I have my first testing week in Beauty School and I am a nervous wreck. Luckily, this week started with a day off and I got to go do a little retail therapy with my sisters before the testing begins. I have 3 days of testing before me and I have done all I can do to study, now I just hope it all stays in my brain so I can pass everything. I contemplated not working out this morning so I could get some extra Zzzz's but I thought getting up and getting my blood and brain going before school would be helpful ( I also thought the Venti latte might help). This mornings workout was a doozie. Apparently yesterdays was harder so Im not to sad about missing it because todays whipped my tail. Today was 3 rounds....400m run, 20 ring pull ups, 15 overhead press, and 10 burpees with a broad jump. I know my limitations so I left the broad jump off of the burpee but everything else I did as required! After the first round of burpees I just knew i was going to hurl. I made it through and back out to the run and things just got worser and worser! I made it thought the workout, dead last, but I freaking finishing. Thanks to Big Bad Cheryl who did the last 5 burpees with me. When it was finished most people walked around picking up their weights, not me, I laid in a giant sweaty pile on the floor trying really hard not to die or puke. IT WAS NECESSARY! 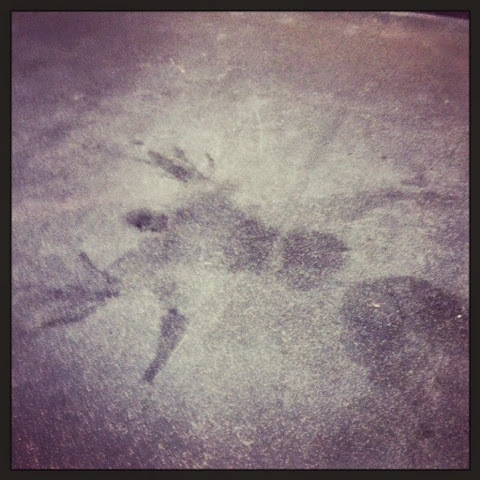 Not everyone can start the day with a sweat angel! Now that it is over I am so glad that I went but I can already tell my body is going to hurt after that workout! Now Im enjoying my latte while getting in the last few minutes of studing I can before its time to start testing. Wish me luck and shoot up a little prayer for me today. Good luck on your test today! Glad to know my name is still "Big Bad Cheryl"!